Disease Gurus Shed Light On The Terms Of Infectious Diseases — But Not Every Term Is Easy To Define : Goats and Soda When it comes to talking about infectious diseases, researchers have their own special jargon. But even they aren't always 100 percent sure of the definitions. If you've been following the news about the spread of the Zika virus throughout Latin America, you've probably gotten lost in the jargon once or twice. What's a vector? A reservoir? What's local transmission — the opposite of express transmission? So we went to the experts to help us wade through all this murky language. And they were helpful — sort of. Because it turns out that even the experts don't agree 100 percent on the definitions. "Well the first thing to keep in mind with this sort of terminology is it's all in the eye of the beholder, to a certain extent," says Dr. Arnold Monto, an epidemiologist at the University of Michigan School of Public Health. Technically, an outbreak and an epidemic mean the same thing, Monto says. Both refer to a sudden increase in the number of cases of a disease. Generally an outbreak is used to describe the spread of a disease in a smaller geographic area, whereas an epidemic may describe the spead of disease through several communities or cities. But the key difference is that the word "outbreak" sounds relatively innocuous whereas "epidemic" carries a bit more weight, Monto notes. "So choosing which word to use is not pure science," he says. Public health officials may choose to use one or the other depending on the sort of message they want to put out. "With Zika, I think calling it an epidemic is a way to bring attention to it and mobilize resources," he says. Since Zika has spread to South and Central American countries where it has never been identified before, and since scientists suspect a link between the virus and neurological problems in newborns and adults, Monto understands why health officials are using the more weighty "epidemic" while discussing Zika. The words endemic and pandemic have more precise definitions. The former is used to describe "the baseline ... level of the disease," according to the Centers for Disease Control and Prevention. So there'd be an endemic level — or expected number — of flu cases in the U.S. each year. The latter refers to multiple outbreaks happening across the globe at the same time. "Pandemic has been used to describe outbreaks of cholera occurring in various countries," Monto says. In the 1960s, for example, an outbreak of cholera in Indonesia quickly spread across Asia, Europe, Africa — by the early 1990s, it had made its way to Latin America. A pandemic affects communities all over the world, Monto says. It's a public health issue of international concern. Now let's turn to another set of words used to describe the mechanics of an outbreak like Zika. Like, what the heck is a disease reservoir if not a terribly disgusting lake? "It's any environment where an infectious agent can live and multiply," says Allison Aiello, an epidemiologist at the University of North Carolina at Chapel Hill. It could be one or more insects, animals, even soil — "anywhere these disease-causing viruses or microbes can live and thrive." But typically, the word refers to animals who can carry a disease," Monto says. Say that Zika can make both monkeys and humans sick — monkeys infected with Zika would be considered the reservoir. "We don't generally use the term reservoir for humans," Monto notes. That's because "even if we eradicate the disease among humans, we'd want to pay attention to the animal reservoirs to make sure a monkey doesn't reintroduce the disease and cause it to come back." Then there's the term vector. "A vector is anything that can pass on an infection to another organism," says Aiello. So a mosquito is definitely a vector. Its root is a Latin word that means "to carry." But what about humans: Can we humans be vectors? Technically, sure, says Aiello. But Monto says he probably wouldn't use the word to refer to humans. 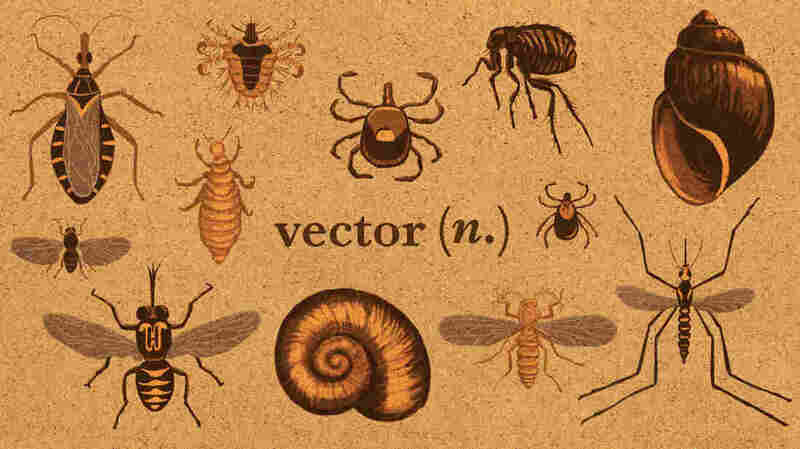 "To me vector is usually an arthropod [insects and other animals with exoskeletons]," Monto says. "Like a mosquito or a tick." So the Aedes aegypti mosquito, whose bite transmits Zika, is a vector for the disease. When public health folk talk about "vector control" they're usually thinking about calling in the entomologists or deploying health workers to fumigate the swampy, mosquito-y neighborhoods. "So you see, we use specific words to mobilize specific sectors within the public health community." Ultimately, it's a matter of preference. Got it. And what's local transmission? That's when a vector transmits a virus to a human in a certain place. "To have local transmission you've got to have the vector and the virus present in the same place — that's when the disease can really start to spread." How do people in the public health world keep all this straight? "Honestly, when talking to a general audience, I try to avoid using any of this kind of language," Monta says. "And when talking with colleagues in my field, we just focus on the facts and statistics!"